That leaked tracklist? Fake. But a four-disc special edition, to be released Nov. 24, seems increasingly likely. First, the bad news. 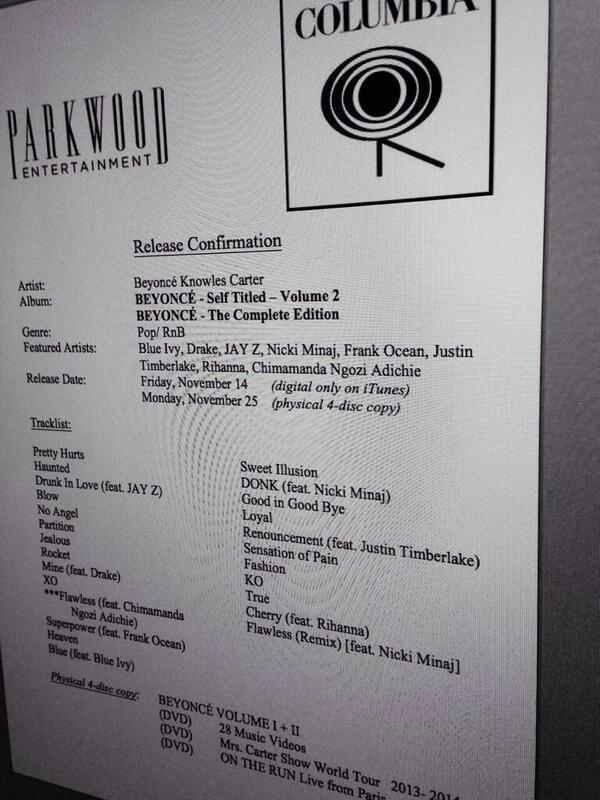 That tracklist for Beyoncé — Volume 2 that was circulated this weekend seems to be fake. BEYONC&#xC9; platinum edition track list. BEYONCÉ platinum edition track list. Two clues? "Good in Good Bye" is actually a lyric from the highly underrated "Best Thing I Never Had" and November 25 is a Tuesday this year. This morning, a Twitter user claiming responsibility for the "leak" admitted as much. But here's the good news: Beyoncé appears to be planning something. Rumors of a four-disc platinum edition of Beyoncé have been circulating since early October, when international retailers began listing it online. &#x27;BEYONC&#xC9; Platinum Edition (4 Discs)&#x27; has been listed for pre-sale on multiple European music stores! 'BEYONCÉ Platinum Edition (4 Discs)' has been listed for pre-sale on multiple European music stores! Fueling speculation was the fact that three new songs have been registered with ASCAP under Beyoncé's name: "Cherry," "Donk," and "Partition (Remix)." And then today a fan account noticed that a number of Amazon stores around the globe currently have the album up for presale. BEYONC&#xC9; [Platinum Edition] - 4-disc is also available on Amazon France: http://t.co/25nHbx1s2s - On sale Nov. 24. BEYONCÉ [Platinum Edition] - 4-disc is also available on Amazon France: http://t.co/25nHbx1s2s - On sale Nov. 24. Also of note: November 24, 2014, was the original release date for rumored collaborator Nicki Minaj's album The Pinkprint before it was rescheduled for December 15. It wouldn't be the first time Nicki delayed a release for Beyoncé. Over the summer she pushed the release of single "Anaconda" so Queen Bey could drop the "Flawless" remix first. Start saving your pennies, folks. The Queen is coming to reclaim her throne.